In this article, Arjun Venkatraman of the Mojolab Foundation describes the new avenues for social and economic impact emerging from the innovative CGNet Swara audio portal service in the tribal areas of central India. The Swara Network has helped highlight new business models for delivery of services ranging from health to notary authorisation. Moreover, the cost challenges associated with mobile telephony have encouraged low cost innovation in audio portal technology by the Mojolabs Foundation, which was set up for the purpose. Together, Swara Network and Mojolabs offer interesting directions for exploring the challenge and promise of scale in social entrepreneurship. Started as an experiment in community newsgathering by veteran journalist Shubhranshu Choudhary, CGNet Swara is a groundbreaking audio portal service. The audio portal consists essentially of a phone number linked to a website, allowing users to access the portal by phone or on the web. Callers to the phone line have the option of listening to messages left by other people or recording their own messages. The target audience for the phone system are poor and marginalised communities in central India, who have been left disenfranchised by the lack of a voice in the mainstream media. The service reaches areas off the railway maps of states such as Bihar, Jharkhand, Andhra Pradesh, Madhya Pradesh and Chhattisgarh. In addition to reporting, users are encouraged to request assistance from listeners in resolving their grievances. Volunteers and contracted team members from CGNet Swara follow up on actionable content and attempt to bring them to closure. Over the three years of its existence, CGNet Swara has created a strong presence as a source of authentic grassroots reportage as well as a generator of social impact through communication. Today, CGNet Swara is supported by the United Nations Democracy Fund and Hivos, an international development organisation. 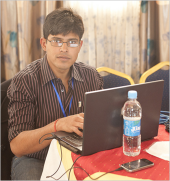 For the future though, the Swara team is working hard to find ways to become sustainable without external funding. At the same time, what started as a pilot with a single phone line has grown to become the Swara Network, which includes Adivasi Swara (specifically targeted at indigenous communities and languages) and Swasthya Swara (targeted at practitioners of traditional healing methods). This also means growing operational requirements. The challenges of scale, both operational and financial, in reaching difficult to reach populations drive innovation in the Swara Network. Speaking and listening are natural ways of sharing information. In contrast, reading and writing are secondary skills that require time spent in school, for which the opportunity cost is often too high for the poorest in India. At any rate, what Swara demonstrates at a basic level is that a voice-based information sharing mechanism allows people who have so far not been connected to become part of global conversations. Voice is a great bridge across divides of many kinds. By bridging divides, Swara-like platforms become the mechanism for re-ordering functional communities. People who would normally not communicate with each other find a basis to converse. Social media platforms are one of the best demonstrators of this sort of cross-divide community building. When a voice-based community gets linked up to social media, the effects are quite phenomenal. Much of CGNet’s social impact today comes from the social media outreach by which voice content from the Swara Network is shared with listeners in cities, who frequently respond by acting as requested. Sometimes these listeners even come up with ideas of their own on how to get closure on the issue being discussed. As new communities get created, new opportunities for generating livelihoods and sustainability begin to emerge. The exchange of information typically is a precursor to the exchange of tangible goods. For example, CGNet Swara itself creates livelihoods by providing accommodation and a monetary stipend to members of the community to participate in the curation of content and in follow up for impact. At the same time, CGNet Swara has also resulted in several similar efforts being started, resulting in an ecosystem that has a growing demand for community members trained in managing such platforms. Meeting this demand by itself is a prime driver for entrepreneurship in the human resource and capacity building sectors. Almost all members of the Swara Network are engaged in training of some nature to meet this demand, either through one of the supporting projects, or through community initiatives. Social media platforms are one of the best demonstrators of this sort of cross-divide community building. When a voice-based community gets linked up to social media, the effects are quite phenomenal. Much of CGNet’s social impact today comes from the social media outreach by which voice content from the Swara Network is shared with listeners in cities, who frequently respond by acting as requested. Sometimes these listeners even come up with ideas of their own on how to get closure on the issue being discussed. Two examples can help demonstrate this impact. Swasthya Swara, for instance, a platform started as a means to curate information relating to traditional healing practices from the rural and forest-dwelling communities of central India, is also providing a means for practitioners of healing in villages to connect with people in cities. This is expected to create a demand for services as well as tangible products such as herbal medications, etc. This could prove a valuable, sustainable source of revenue if an appropriate supply chain can be designed around it. Another example comes from a very different arena. Licensed public notaries in rural and small town India currently earn close to Rs 2000 per day from legal paperwork such as affidavits, property documentation and personal contracts such as marriages, divorces, leasing of property, etc. By connecting a community of notaries together behind a shared voice interface, a funnelling effect could be achieved, where community members simply record the relevant details for the paperwork they need done by the notary of their choice and the requests so collected could be batch processed for more efficiency, resulting in a higher through-put and more earnings. The analogy of a funnel is apt because the introduction of a remote voice interface with a specific function to the community allows for a much larger number of potential service consumers to reach a dedicated set of service providers. Also, since the interface is automated, it is possible to keep the content that reaches the service providers specific enough to be conducive to batch processing. Both of these projects are under active consideration by members of the Swara Network. As the Swara Network expands and diversifies, more opportunities continue to arise. While revenue generation strategies are important, it is crucial to identify the cost centres and vulnerabilities in the model itself and find ways to plug them. Most importantly, the voice model relies on the media that transmits voice from one point to the other. In the current scheme of things, most channels that allow the transmission of voice are regulated at least in some measure by government and owned almost completely by large corporate interests. However, platforms that rely on media owned by external interests necessarily have to regulate content in conformity with those interests, at least to some extent. This limits the effectiveness of these platforms as a means for people to express opinions. While the regulation of content is an important challenge, a far more pressing concern is the cost involved in using externally owned media. 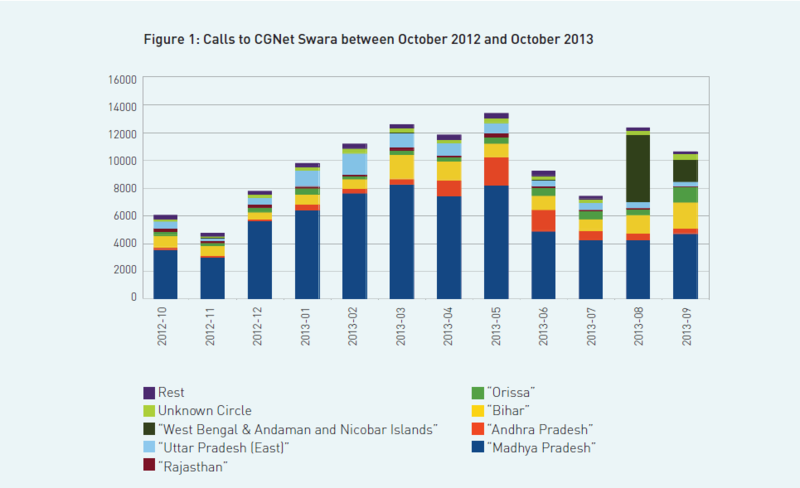 Figure 1 shows the number of unique phone calls received by CGNet Swara, which includes listeners, contributors and spam calls. 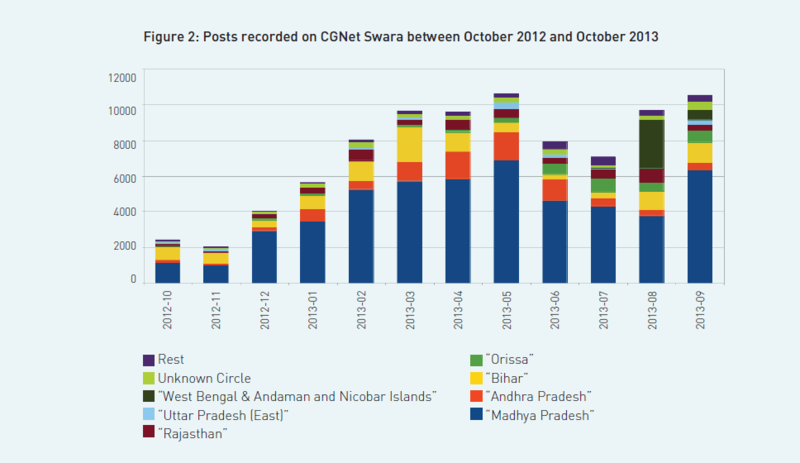 Figure 2 shows the number of unique recordings received by CGNet Swara, including unreleased content and spam. Note that the number of posts is about one-tenth the number of calls. 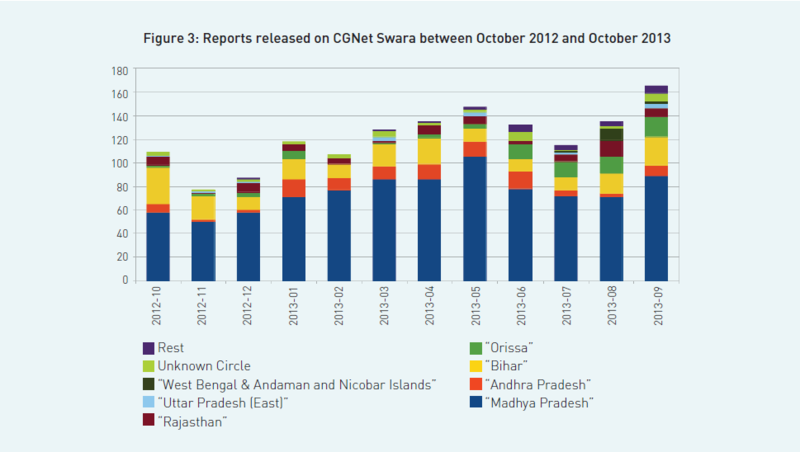 Figure 3 shows the number of unique reports published by CGNet Swara, after curation of content by members of the community and professional journalists. As one can see, the curation process further filters the posts down so that the number of reports is again about a tenth of the number of posts. Finally, Figure 4 focuses on the number of stories that were followed through to closure, i.e. where a user called back to confirm that an issue raised by them on the platform received a response that was satisfactory to them. Notice the further drop in order of magnitude. As Figure 1 reveals, much of the call volume is composed of listeners. In the case of CGNet Swara, neither listeners nor callers pay for a call. They simply give a missed call to a phone number and the system calls them back. The cost of the call is borne by the grants supporting CGNet Swara and the rest of the Swara Network. The graphs also show that the impact is correlated with the call and report volume. In the event that CGNet stops paying for the free listening without providing an alternative, it is expected that the call volumes and correspondingly the impact volumes will taper off quickly. 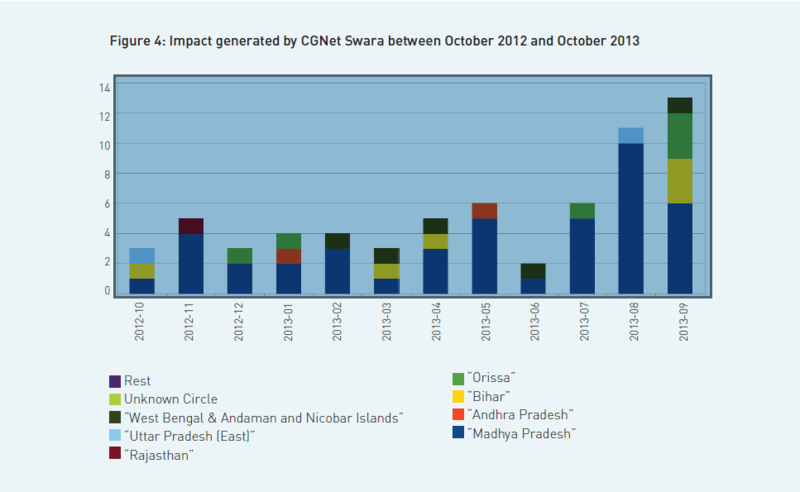 This is why mobile telephony costs are the single greatest barrier to ramping up the reach of CGNet Swara. Given the laws in place around mobile telephony in the country, it is not possible for communities to own the physical infrastructure required to support mobile telephony without a license. Community radio is one alternative that has recently become legal. However, it is still very expensive to set up a community radio station and strong restrictions remain on what content can be broadcast. To find solutions to these challenges, the Mojolab Foundation was founded by core Swara team members in collaboration with other innovators in 2012. Today the Mojolab works on developing cheap communication solutions that allow communities to set up Swara-like platforms and run them for as low a cost as possible. Over the last two years, the Mojolab team has brought down the cost of setting up an audio portal from about Rs 200,000 (US$ 4000) to Rs 15000, i.e., US$ 300. This is done using open source technology in both software and hardware. The Swara Interactive Voice Response system, originally developed by Massachusetts Institute of Technology (MIT) students and Microsoft Research India’s Bill Thies, is maintained under a General Public License. The Mojolab team has customised this software to run on a low cost, open source, single board computing device called the Raspberry Pi. To enable free listening, the Mojolab team has been working with delicensed frequencies and reducing the cost of the equipment that allows communities to use them. Citizen Band, i.e. 26.9 to 27.2 MHz is a radio frequency that has been made available for delicensed public use. The other such frequency is 5.825 to 5.875 GHz, used by wireless local area networks (LANs). Mojolab is currently working with radio enthusiasts to refine a low cost citizen band receiver that people can use to listen to broadcasts made from low power citizen band transmitters linked to audio portals. With the ability to listen for no incremental cost, the user base around each audio portal could scale exponentially without having to rely on an externally owned communication medium. Similarly efforts are underway to utilise wireless mesh networks to enable community level data sharing and communications. The data collected from the Swara Network promises a storehouse of knowledge about communities who have been typically beyond the reach of mainstream media. So far mainstream advertising has not been necessary to popularise the Swara Network audio portals. The entire user base is generated by word of mouth. People who find value from sharing their stories on the Swara Network then go out and share their experience with other community members. Since the only way a new user comes to the Swara Network is when they are referred by another user, the call volumes provide a strong insight into the effectiveness of the platform. This enables the community members engaged in managing the platform to make corrections in their content management mechanisms in real time. Though content ownership and privacy concerns also need to be taken into account, further analysis of the data collected from platforms such as the Swara Network could provide many insights into social attitudes and reveal new ways to cause sustainable social change. For example, time-based usage patterns correlated with gender data could reveal answers to questions like when (and how often) do women in rural India have access to a phone, i.e., to communication? All of the innovation done at the Mojolab is available to everyone free of cost in the form of open source software and hardware. Mojolab team members provide consulting services in an individual capacity to communities interested in contracting out the setup of audio portals. Any new work undertaken is typically kept open source as well. With the development of more such communities, the targeted application of low-cost technology to the chronic problems of India’s billions is fast proving to be the way to sustain social impact. 1 The audio of the song is available on request. 2 In the following figures, all call data is classified by telecom circle. Some telecom circles encompass more than one geographical state, for example, Bihar Telecom Circle comprises both Bihar and Jharkhand, and Madhya Pradesh has both Madhya Pradesh and Chhattisgarh.